If you want a taste of your childhood, visit Nona’s Snow Wiz on Shady Grove Drive. Ms. Nona McGowan has been serving sweet and icy confections from her stand in South Bossier for 25 years. While the best seller at Nona’s is wedding cake, McGowan chooses her own favorite each year and this year, it is sour apple. The sour apple and polar punch mixture was very good – not too sweet but a great mixture that was colorful and took me back to those carefree days of childhood. The ice is more of the crushed variety, typical of a snow cone. Once you head into central Bossier, you start getting into the fancier ice – snoballs AKA shaved ice. 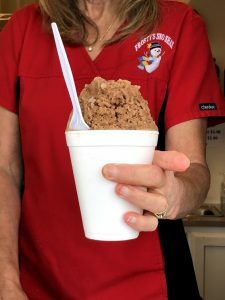 At Frosty’s Sno Shak, Sandie Hayes will greet you with her sweet smile and delicious flavors, including her secret recipe Dreamsicle. This creamy, chocolate flavor is great with or without added cream and tastes just like a fudgesicle. Frosty’s offers more than 30 flavors but the best seller is strawberry cheesecake and it is stellar with cream in the middle. Frosty’s offers other sweets – candy bars and the like – and pickles, too. There are snacks galore at Frosty’s! Prices: $1-$4 (plus extra for cream, etc.) with five different sizes; military discount available and police and firefighters in uniform get a free snowball. Check Facebook for a frequent visitor perk! A traveling snoball truck? What a stellar idea! Erica Gilliam, a New Orleans native, brought two of her favorite things about the Big Easy together in North Louisiana – streetcars and snoballs. Now, these aren’t your average snoballs and they definitely aren’t snow cones, Gilliam says. It is ALL about the ice. 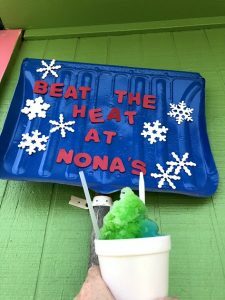 And, according to Gilliam, traditional snow cone stands don’t offer cream flavors but traditional New Orleans snoballs include cream flavors – not just cream on top but cream IN the flavors. Gilliam’s specialty is a delicious creole cream cheese, which was only made better by a drizzle of real strawberry. And, that snoball will just melt in your mouth the ice is so fluffy. But her favorite? Doberge. A creamy snoball that is reminiscent of the South Louisiana cake. What else makes Streetcar Snoballs different? They travel. This food truck will travel within a 50-mile radius and Gilliam does private parties and corporate events as well as making public stops.